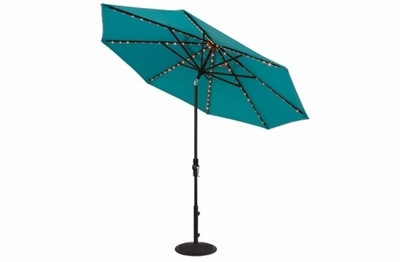 Shade yourself from the hot sun by day and illuminate your outdoor gatherings by night with the Treasure Garden 9' Starlight Collar Tilt Aluminum Patio Umbrella. With its built-in LED lights you can easily transition from a day time gathering to a festive evening get together with ease. This outdoor umbrella has a collar tilt mechanism that allows you a limitless number of tilt positions to put the shade or lighting at just the right angle. With its sturdy powder coated aluminum pole and its variety of premium Sunbrella and Obravia fabrics for the canopy, this patio umbrella is sure to add some upscale flair to your open-air space. Let your outdoor umbrella do double duty this season so you can just sit back, relax and enjoy everything that nature has to offer. * Weight: SWV: 20.3 lbs. DWV: 21.3 lbs.